When you walk up to the cathedral (all the way to the sign) you can see a bunch of huge cracks on the opposite side to Sultan. Does anyone have any info on these, and more importantly, how do I get down? Cheers! Have you had a look at the topos in the guidebook update? Are you asking about Twin Cracks, Sideswipe, etc or further left? Further left than twin cracks. I took a photo but am not sure how to post it from my phone? I think that's Desperation Crack, The Pinch, Lord High Exe cutioner, Sorcerer's Apprentice, Longbow, Precious. Page 142-143 of the guidebook. >Further left than twin cracks. I took a photo but am not sure how to post it from my phone? You probably can't because Chockstones upload process asks for a location (of the desired picture), and it doesn't recognise phones because it looks for a 'drive' on your computer. >I think that's Desperation Crack, The Pinch, Lord High Exe cutioner, Sorcerer's Apprentice, Longbow, Precious. Page 142-143 of the guidebook. ajf is on the money with his replies, so it sounds to me that you don't have a Buffalo Guidebook with you; ... & no, Sublime Climbs (good as it is) doesn't quite fill all the nuance-gaps for me, so I suspect also for you (bc) too! >any info on these, and more importantly, how do I get down? Cheers! If you are talking the many gutters / off-widths below saddle level on the western side to where you walked up, then more than one historic punter (including me) has traversed the base of those looking for gems. IMO topping out from those would involve a scrub or rock scramble, or at worst finding a natural anchor and abseiling back down. The traverse / circumnavigation from Tatra Inn around the west side of Cathedral, back to the road on NE side of Cathedral, is an arduous undertaking, so be prepared for many cul-de-sac /dead-ends, and this time of year copious grass seeds in your socks! 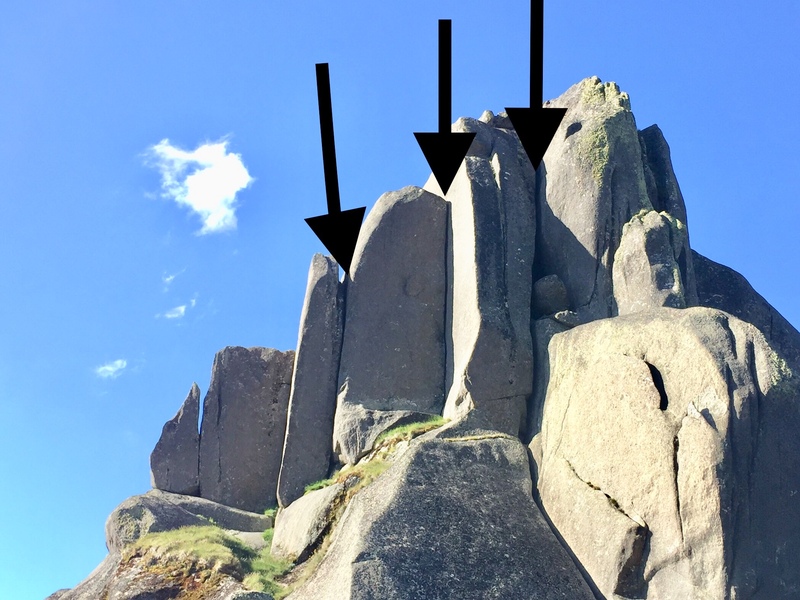 If you are talking the prolific number of cracks that have been done above the saddle where you ended up, then the guidebook is your friend for getting off them after topping out; ... in a nutshell the easiest option without abseiling off a natural anchor, is to reverse (down-climb) the Tourist Route. > is to reverse (down-climb) the Tourist Route. load up to https://imgur.com/ ie (new post) and provide url here. To be honest, I'm not sure what the routes are that you've said. I've only been there once! I took a photo and uploaded it so if anyone knows what grade they are or their names (if they've been climbed) that would be great. I also climbed Cacophonic crack the other day on M9’s recommendation and it was burly! the right line is The Pinch 16 as it "starts around the buttress L of Desperation crack, up the easy angled corner" then goes up the corner, then the crack in the r wall. Over blocks to cave. Pitch 2 past two BRs on the L wall of the cave to the chimney then up. That'd make the line between the two right arrows Lord High Ex3cutioner 20 which follows The Pinch until at the ledge to the R, the route "leans L to gain face crack"
Sorcerer's Apprentice 19 is the middle arrow. Longbow 19 is the left arrow. I want to do those routes. >I want to do those routes. Start your training, for when my recovery allows it I’ll alternate leads with you! >I also climbed Cacophonic crack the other day on M9’s recommendation and it was burly! It’s G21 so you should find the G19’s easier, though I haven’t done them so I can’t vouch for that. Hand Vice is good at 18 or 19. The top pitch of Wicked Solitaire is good around 17 or 18 too. First pitch of Angels is a great crack at 17 and the rest of the route is good too. Taking a drill with you might result in harm to your person. >Taking a drill with you might result in harm to your person. Buy an appropriate bigbro* and use that/those instead, or I promise that if I’m able I’ll chop such bolts myself! Those routes were done originally pre bigbro/giant slcd days so please respect the original ascensionists and style of ascent, or put up your own similar new routes (in the seemingly dumbed down new-vogue style). Semi-pissed old fart speaking here...!! Try Jaws whilst you are in the area. I lost more skin on that route than any other at buffalo and it's not even 25m long. Where is this jaws you speak of? and put in those rap stations then i'll go do the routes.getting off did look epic. Do you kinda squeeze through a little cave thing and then it’s on the left? There are 30 messages in this topic.